This fixture was played in glorious early May sunshine and record temperatures exceeding Barbados. After last week's cancelled matches, it was a much anticipated fixture with several debutants, including Ilyas Mansha and 11-year-old Ebrahim Khan (a chip off the old block? - TC). 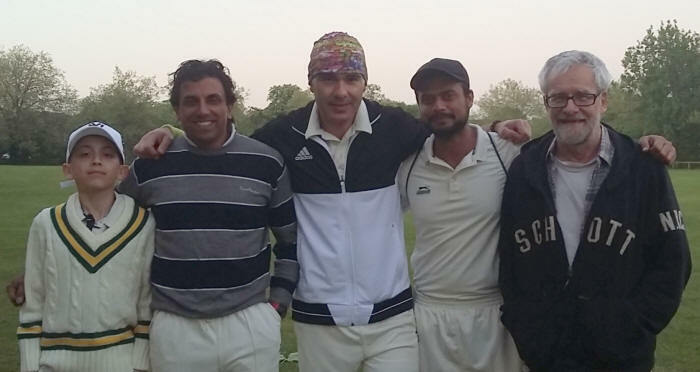 Woodford were put into bat on a flat track and got off to a solid start, before an unplayable yorker from Mujahid broke the opening partnership. Predictably, our spinners, Steve Hamilton and John Shaw, had more success with a fine stumping for Kafh Hassan giving John his first scalp. Steve in particular varied his pace well and, as in 2017, was the pick of our attack. 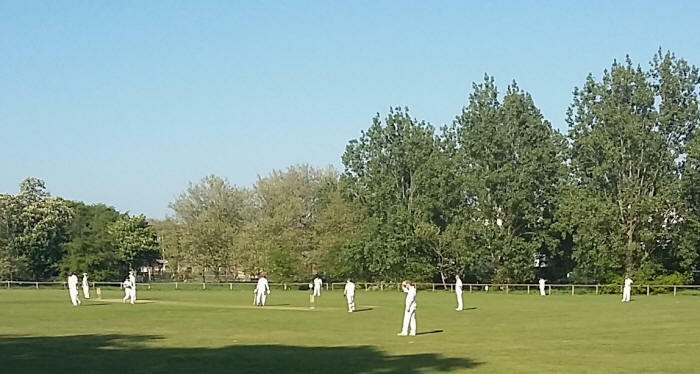 Our deplorable over rate forced the match to be reduced to 35 overs per side and a brilliantly destructive cameo from Nathan took Woodford to a highly competitive 196. Our seamers, Raj , Naveen, Daryl, Mujahid, Zohab and Ebrahim, bowled well on a lifeless wicket. Yours truly struggled with length and some good yorkers were mixed with too many full tosses. Openers Kafh and Ilyas were instructed to push the score along and a win seemed on thanks to a superb aggressive 29 from Kafh. A highly dubious run out decision from nicotine-intoxicated Sohaib triggered a crisis at 45-4. Hereafter, Darryl and Naveen put on a courageous 67 and a second consecutive OF win seemed likely. However, Darryl's wicket led to a calamitous collapse, as we folded from 112-4 to 133 all out. Sadly, despite a superb 52, the talented Naveen once again could not get us across the line. Credit to some late resistance from Steve and Ebrahim. A lack of match practice clearly evident but lots of positives for us against a Woodford side comprising a few Saturday 2nd XI players.